Hello! It has been a while my readers, although you may have not noticed the gap at all, but we are back with another shoe blog! This time around we are going to review one of the more anticipated updates: the Saucony Triumph ISO 5. As fall and winter quickly approach the weather will be cooling down and everyone knows what that means: more miles outside. When running outside, especially here in Central Florida, there is a very apparent lack of trails. That leaves many of us pounding out our miles on concrete and asphalt. While not technically necessary to have a high cushioned shoe, it can definitely make those road miles feel a little nicer. 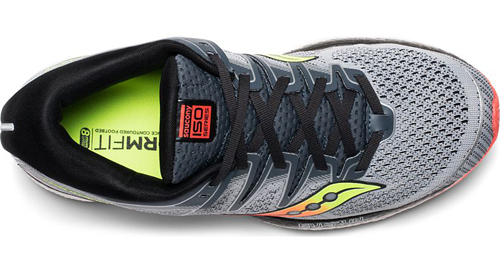 When it comes to soft, responsive cushioning, few do it better than the Saucony Triumph. While I am not one to typically dabble in higher cushion shoes, I have recently used a couple for longer runs or days I feel a little beat up, and I can honestly feel the difference. Maybe my old 26 year old bones are just finally giving up on me, but soft and plush feels kinda nice. The Saucony Triumph absolutely fits the bill. Saucony created their patented EVERUN foam and pumped it into the entire midsole in their Triumph series and the 5 is no different. The full length EVERUN midsole provides that cloud feel, while also maintaining a little bit of that snappy responsive sensation. They have covered the outsole with their crystal rubber which is one of the more durable and tactile outsole materials on the market, but we all know more importantly as Saucony explains it is, “Easy on the eyes.” The ISO fit that has become almost synonymous with Saucony is present as ever, which for the uninitiated I’ll break it down in a sentence or two. ISOFIT essentially means the tongue of the shoes encapsulates the foot in a “bootie” which flex and hugs the curves and crevices of the foot to give a custom feel. 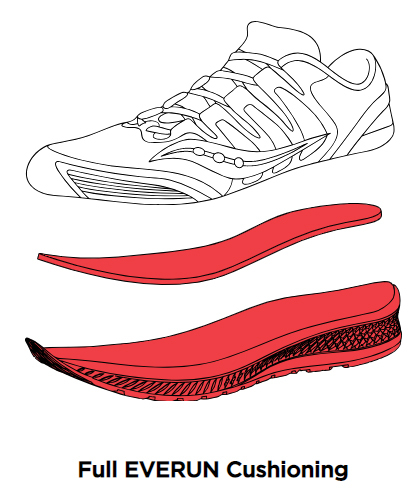 Building off that, is Saucony’s FORMFIT tech. Rather than building the shoe from the ground up, they started with the sock liner down ensuring there was as much contact with the foot as possible throughout the production process resulting in a more connected feeling with the shoe and therefore the ground. There is some more tech in the shoe but those are the need to know, heavy-hitters of the shoe. Let’s move on to the stuff that matters to those currently running in the Triumph ISO 4 or are interested in trying it out—the fit. How is this shoe different than the past models? As much as I love Saucony, the Triumph 4 was a tough model to fit longtime fans of the shoe. It had its fair share of problems, but I have good news, they have fixed a good number of them so let’s unpack that a little bit. First off, the shoe has a bit more volume, which is a good thing. As I have stated before, I have a pretty narrow, size 8-8.5 foot. This shoe will accommodate most sizes but I sized down to an 8. Take that with a grain of salt but you should always get resized when trying a new iteration of a shoe. The shape and ground feel is a little different on this shoe because they have made some structural changes. Just like sucking your gut in for the family photo, the Triumph has lost 2mm from the outsole and put in it the midsole which essentially just means more cushioning for you. One last difference between the ISO4 and 5 is the weight of the shoe has increased about half an ounce, which isn’t a huge deal but it is definitely worth noting. Overall, this shoe is a great update to a previously lacking model. Saucony has righted themselves back on the railways and if you are looking for that plush, high cushion shoe this is definitely one to try out. So come on in, try them out and pound that pavement! I received a pair of these from Saucony to run some miles, test them out, and see how they felt. In total I’ve probably ran about 15 miles on them and there are two main things I want to hit about how I personally felt. First is the actual fit of the shoe, I went down a half size and was glad I did. That being said getting the appropriate size, this shoe fit my foot very well in terms of the ISOFIT and FORMFIT so it was comfortable. I am usually one for very firm, responsive shoes, I have never ventured too far into that high cushion territory so this was one of my first genuine experiences. I really enjoyed my runs in the shoes. I think for me personally they are a little too soft to train every day in, but it is a perfect shoe on days I feel beat up or my feet hurt. If you like high cushion, the Saucony Triumph ISO 5 should absolutely be on your list to try. Share your experience running in the a Saucony Triumph!